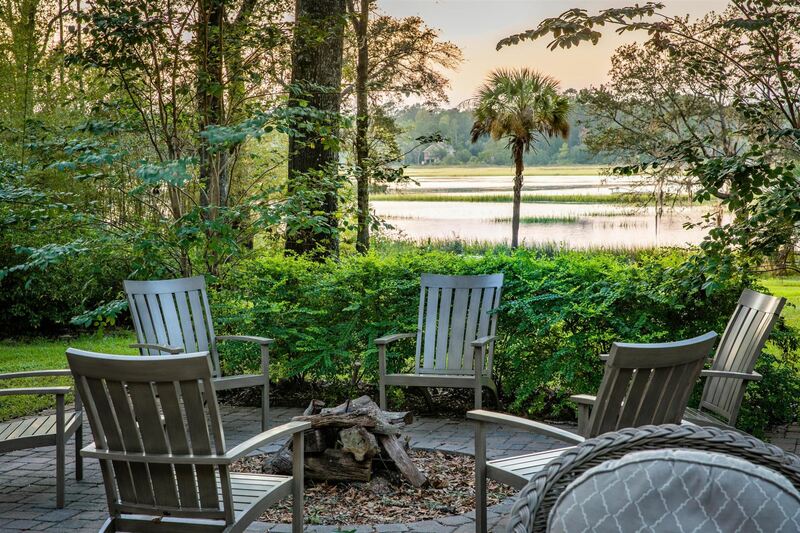 2450 Cat Tail Pond embodies the very best of Seabrook Island living, truly a ''total package'' for anyone interested in making this island a part of their lives. Custom built by Carter-Bignon, the home features all of the custom, classic finishes and design that individuals have come to expect. Enter through the beautiful mahogany double front doors into a contemporary interior featuring tigerwood floors, high ceilings, handsome trims and molding, custom lighting and outstanding finishes and appointments throughout. The one level floor plan offers a formal living room with tray ceiling, a separate dining room, spacious study with built-ins, family room with fireplace and breakfast nook. The gourmet kitchen is both beautiful and functional. Generously sized, the space features all custom William Pritchard built cabinetry, Thermador professional grade appliances, including refrigerator and freezer towers, warming drawer, two ovens and six burner gas cook top, granite counters and large center island with seating. A butler's pantry with dishwasher drawer, sink, bar fridge and wine cooler make entertaining a breeze. A casual place to relax, enjoy refreshments or dine, the 900 square foot sunroom offers a wall of windows overlooking the manicured yard and the 6th fairway of Crooked Oaks golf course, bead board ceiling, stamped concrete floors and a fireplace. The master suite offers a quiet retreat from the home's two en suite guest bedrooms and enjoys private access to the sunroom, a tray ceiling, two walk-in closets and marble bathroom with walk-in shower, soaking tub, double granite vanity and water closet. A bonus room on the garage level is ideal for a game room or storage. Additional highlights include: Hardie plank siding, elevator from the garage level, integrated sound system, Culligan whole house water purify system, parking for four vehicles & garage is commercially dehumidified, hurricane rated windows and doors, large ground level covered patio, outdoor shower, large laundry room with a sink and storage, an integrated propane powered whole house generator and professional landscaping. Furnishings are negotiable. Seabrook Island is home to a private beachfront community with two championship golf courses, a tournament grade tennis center, full-service equestrian center, fitness and aquatics complex, long unspoiled beaches, a seasonal variety of indoor and outdoor dining venues for lunch, dinner and your own private events of any size. Also located on the island proper are Freshfields Village and Bohicket Marina. Freshfields Village is a unique town center mix of shopping, dining and service establishments in a stylish and relaxed outdoor environment between Seabrook Island and neighboring Kiawah Island. Bohicket Marina is home to 200 wet slips, 90 dry storage slips and a quaint market with wonderful restaurants and shops. Contribution to capital within P.U.D. upon the initial sale and resale is 1/2 of 1% of the sale price. Purchase also requires membership to the Seabrook Island Club. Buyer is responsible for a $100 transfer fee at closing. I am interested in more information about 2450 Cat Tail Pond Road.